Today we are going to tell you about Harman Multimedia's products, a subdivision of Harman International Concern which owns trademarks of high-quality consumer audio equipment, namely JBL and Infinity acoustic systems and Harman-Kardon components. Harman Multimedia manufactures high-quality active PC acoustic systems under JBL and Harman trademarks. Today we will get familiarized with the JBL Creature 2.1 system. 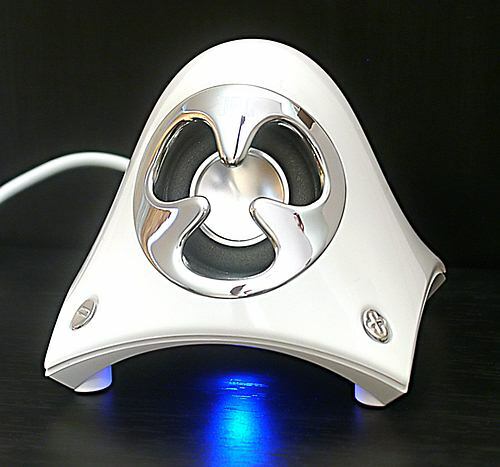 The company offers this model in three colors: white, gray and blue. We tested a white version. This set is packed in a box of rather small dimensions. It measures 27x34x27 cm. The user guide written in 6 languages includes a list of technical characteristics, and an illustrated instruction describing how to get the system up and running. This Creature looks really queer. The designer deverges greatly from the traditional looks and offers us an unusual and stylish exterior. At first sight the fantastic appearance, interesting design philosophy of the subwoofer and miniature satellites confused us. But then, rather quickly, we began discovering many curious things, a bit later we will tell you about all the ins and outs. The satellites are pretty small. Among all multimedia models tested before these speakers are the shortest. Their dimensions are 76x76x76 mm. It might seem that the panels are ceramic. However, they are made of plastic 22 mm thick. The dynamic loudspeaker has the same size and appearance as Creative Inspire I-Trigue 3300 2.1 acoustic set recently tested in our lab. Its cone is made of aluminum foil. The flexible corrugation made of polymer is rather soft. The cone is 3 cm in diameter. Inside there is no filler. The electrolytic condenser of 1000 uF is used as a separation filter. There is no remote control, though it has become a conventional feature for all latest acoustic systems. But they realized the touch-sensitive volume control right on one of the satellites. Such implementation is really praiseworthy. Only two small buttons "+" and "-". If you press them together, the system will switch into the MUTE mode. Unfortunately, you can hear clicks when adjusting the volume. The LED looks very queer. It's located underneath and radiates blue light. Although it's not necessary, such light looks original, especially when reflected from surfaces. The satellite stands on 4 rubber pads. The cable connecting the speaker and subwoofer is 2.5 m long. 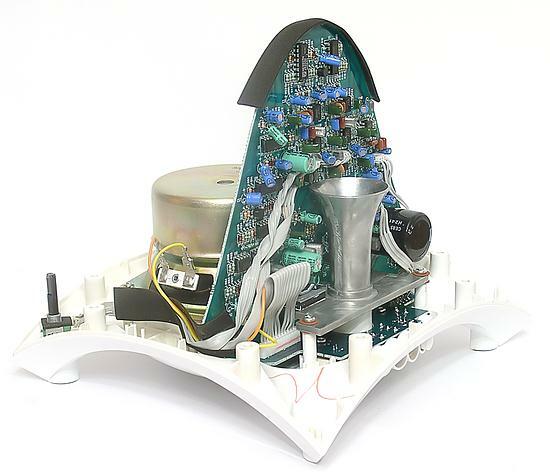 The subwoofer is of the satellites' shape. It makes it even more unusual. It measures 23x23x23 cm with the plastic panels being 4 mm thick. The subwoofer has the phase-inverter acoustic scheme. The LF loadspeaker's cone and phase-inverter's hole are located underneath. The paper cone is 10.5 cm in diameter. The flexible corrugation is made of foam polymer. The LF dynamic loudspeaker is magnetically shielded preventing pickups and demagnetization of the hard drive in case the subwoofer is placed close to a monitor or PC case. Although the amplification board stands upright, it is fixed very well there. The amplification section utilizes two chips, though I couldn't discern the marking. The connectors are of different colors. Besides, you can't insert a connector of the right satellite into the hole of the left one. If you look attentively at the photo of the back panel, you will notice a prominent square next to the right satellite and a prominent triangle next tot he left one. The cables have relief connectors as well. The acoustic system was connected with a 3.5m cable. The sound was produced with Creative Audigy2 Platinum sound card. In general, the sound produced by JBL Creature is pretty good. The stereo panorama is perfect. We often compare sound coming from speakers with a very narrow directivity angle of spot lighting. But you don't get such impression when listening to music with the Creature satellites! It's clear that dynamic loudspeakers used in the satellites do not play mid-frequencies. But a lack of the mids is partially made up for by the subwoofer. 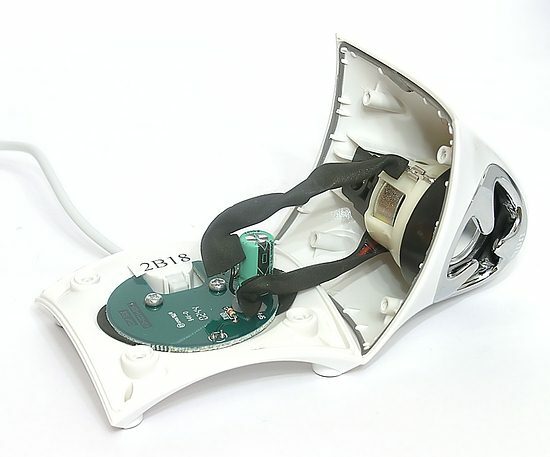 The embedded LF speaker should be regarded as a mid-frequency one according to its specs. And the phase-inverter is designed for a relatively high frequency judging by its hole. The sound from the sub is not so pleasing. But at the acceptable volume level no resonance or parasitic sounds can be heard. Missing low frequencies may be regarded as a cost of the acoustic system's class and positioning. There is also a really useful tone control. In some acoustic systems, raising of highs guarantees only a higher level of distortions. Fortunately, this system is not the case. 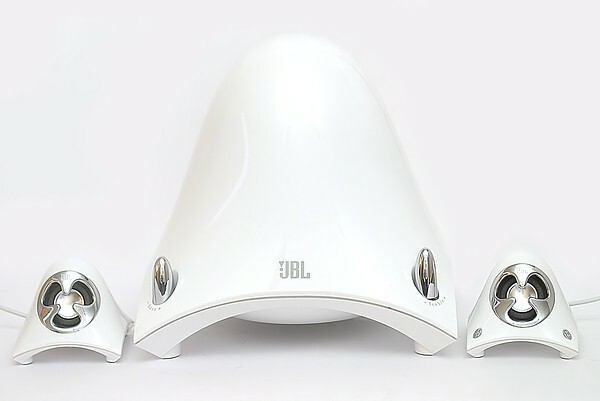 In my opinion, JBL Creature looks the best solution among its competitors we tested before. No 2.1 acoustic systems from Altec or Creative would give superior sound. By the way, we are expecting soon TDK's and Klipsch's multimedia speakers for the tests. 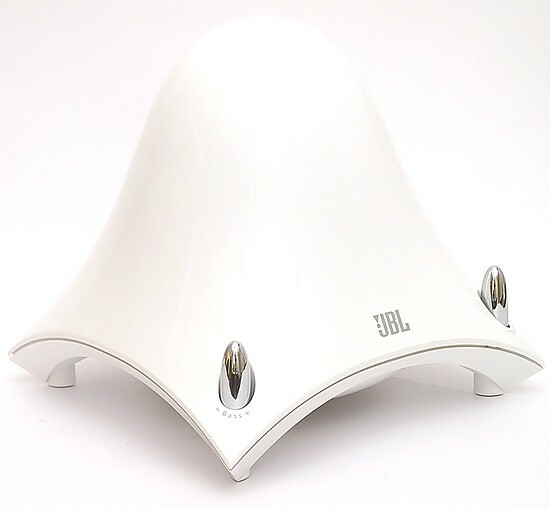 JBL Creature is a very strong competitor in its multimedia acoustic sector. Although its sound lacks middle and low frequencies, such disadvantage is typical of all other models of this class. It's obvious that most manufacturers who position their solutions as stylish and high-quality equipment (not just as a workplace decoration), should follow the example of JBL Creature. 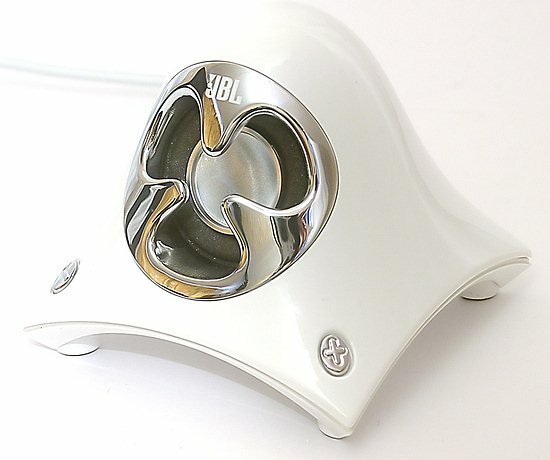 The weakest point of JBL Creature is its price on our local market (about $170). This is an important argument against purchasing this system here. But the recommended price at the company's English site is about $130.